Cabdriving in Los Angeles; illustration by Gustave Doré. Who Came Along for the Ride? In the middle of the road of life I found myself in a shadowy wood, for the straight and narrow path had been lost. Somehow, I had suffered the spiritual death of losing one's way. I was driving a cab in L.A. I describe it as a death and violence, deceit and fraud, cab-driving, police-chasing translation of Dante's "Inferno." It is written as a mirror of the "Inferno," with Charles Bukowski as the guide instead of Dante's Virgil. Each location in hell corresponds to a neighborhood in Los Angeles, along with its punishments. Fun as that sounds, this isn’t a novel trashing LA. The Los Angeles of Taxi Inferno may be Hell, but it's also a lush landscape of human anguish, desire, and deceit. In its own way, the book is a love song to the city, told through the eyes of a lost soul seeking redemption from himself. For all their sinfulness and perfidy, both the city and Bukowski—along with numerous gallons of cheap wine—help the driver in his quest. The result may be the most despairing, soul-revealing, yet grudgingly loving psychogeographic journey through LA since the night Marlowe told himself he wasn’t human. Taxi Inferno could be read casually on its own, but to get the full experience, you quickly realize you should be reading it side-by-side with Dante’s Inferno. The parallels between the two are numerous and carefully constructed. Zane’s book doesn’t just evoke the Inferno; it is the Inferno, Canto for Canto, transposed to a Los Angeles seen through the eyes of a miserable cabdriver and his drunken psychopomp. Instead of ABANDON ALL HOPE we read WELCOME TO LOS ANGELES; in one of Zane’s most beautiful sequences, the innumerable fires of Dante’s Eighth Circle, “A sinner so enfolded close in each,” become the lights of the city viewed from Mulholland drive. For both faithfulness and originality, Zane’s tribute to Dante rivals Menard’s Quixote. You said you had originally considered writing this in a more traditionally ethnographic format, but decided instead to go with fiction. Could you discuss why? I wrote up several outlines and beginnings of chapters on my taxicab research, but it felt too dry to hold my, or any reader’s, interest. When I wrote my earlier ethnography about the altered states of consciousness of an Afro-Caribbean religion, the entire culture was approached in an attitude of wonder at the strange and unknown (Journeys to the Spiritual Lands; Oxford, 1999). Cab drivers and the cab life felt so much just a beat-down version of the ordinary working life all around the industrialized world that I had difficulty presenting the material with any sense of novelty or excitement. My several false starts at writing up the data made me realize I needed to see the cab drivers through eyes I did not yet possess. How did you come up with the idea of a tour of LA by way of Dante’s Inferno? I had read the Divine Comedy in English some years prior to my taxicab research. In the process, I came to realize that I was missing something important in a text so canonical. I could appreciate only a portion of the magnitude of the document. I learned Italian to be able to read Dante in the original. When I finally was able to do so with minimal reference to dictionaries, I began to see the music and to be transported by the metaphors. This happened around the time of my ethnographic research amongst the taxicab drivers. I had been trained as a psychological anthropologist (hence, the altered states research in the Caribbean) and my taxicab research was also a psychological study. The official name of the research project was “The socialization of deceit amongst Los Angeles taxicab drivers.” I was interested in how they cheated their customers, but far more in how they taught each other to cheat and the sanctions against drivers who did not participate in the petty fraud. A larger question quickly emerged: why do the drivers cheat their customers? The simple answer is that taxicab drivers are at the very bottom of an immense architecture of corruption in Los Angeles. Sometimes, a driver would have to pay over a hundred dollars in small bribes a night just to make a hundred dollars himself. As an Angeleño, that revelation was like a kick in the chest (New York is corrupt, Chicago; not my city, not LA). In trying to perceive why Dante was so canonical I found I had to read Thomas Aquinas, but more importantly Aristotle’s “Ethics.” Each of these consistently asserted what I came to believe about fraud in Los Angeles: the worst sins are the sins of corrupt governments against their governed subjects. As I thought about the Inferno particularly (by far, the most exciting part of the “Commedia” for a non-medieval reader), it seemed to me that the ranking of sin by Dante, the weaker sins those of the flesh and the more robust those of the state, matched so closely what I was seeing as a taxicab driver, that I could draw a rather strong parallel. As I sketched out the circles of Dante’s hell, the similarity was too compelling to the taxicab life to leave it alone. Avoiding spoilers (of course), could you talk about the significance of the narrator’s transformation through the course of the book, and his relationship to Bukowski/Virgil? 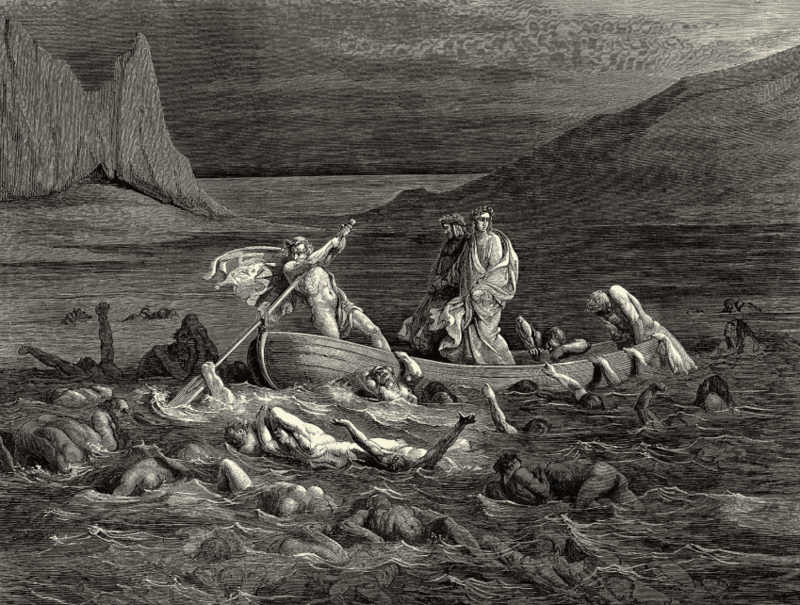 Dante’s Inferno portion of the “Commedia” is modeled on Aeneas’ journey to Hades in Virgil’s great poem. That is modeled on Homer’s account of Odysseus. I knew I was entering treacherous sands by calling forth the most important minds the world has known, and, to minimize unflattering comparisons, I could not make my attempt as straightforward as had Virgil or Dante. Mine is a mirror, a sort of a cracked mirror for a man (myself) to observe these hallowed others (to be looked at, close to, with one eye, from the other side of the glass). I hold the metaphor of the mirror throughout. Dante and Virgil proceed clockwise and Bukowski directs me counterclockwise around Los Angeles. Bukowski's poetry can be thought of as prose presented poetically, and I am pounding out, on my keyboard, a prosaic poesy. I call the text a translation, though that is probably not fair to the general reader; however, occasionally, in the text, I do refer to it as a translateralization. It began first as a translation, tercet by tercet, from the ancient Italian (Tuscan) to modern English, then turned, translated again, verse by verse, to taxicab idiom, which for me meant not only language but ethnographic description. Virgil, the confident guide at the beginning of the Inferno, becomes confused and full of missteps the further down they travel; Dante responds with increasing contempt. Bukowski begins as a tottering old man, barely able to stand, and not only increases in competence the deeper they journey into incontinence, deceit, and fraud, but becomes heroic in his guidance. By the thirtieth canto, the narrator of Taxi Inferno is as fully convinced of Bukowski’s righteousness as he can be of anyone’s, and follows Bukowski through Cocytus’ coccyx, to Hyperion, the destination of all the fecality of LA; willingly, thrillingly, screaming at a hundred miles an hour. The narrator begins the story lost, with no aim but money and sleep; by the end, he is redeemed through poetry, possessing nothing but meter, memory, and a new set of glasses to see the world. You paint a picture of the character, background, and experiences of the narrator/driver; how autobiographical is this character? One can think of ethnographic research in general as first-person science, making nearly all ethnographic reports autobiographical, in the sense that the anthropologist is writing, or distilling, what was seen first-hand: an account, in a way, of a portion of the writer's life. Dante's Virgil is not Virgil's Virgil, and my Bukowski is not Bukowski's Bukowski (or even Chinaski), though close. And something similar is happening with all of these narrators. The narrator of Taxi Inferno is me to some extent, but only a portion of me, or perhaps, we should say, historically me. It is me that chews on the past, and, like a junkyard dog, won't let it go, however dirty and depleted it becomes. That is only one of the many mes, and I think almost everyone can say the same. I indicate in the afterward that some parts of the story are what happened in a usual sense, and that one can tell by paying attention to the person, tense, and mood. Most of the narration uses a first person pronoun predicated with a third person verb, a violation to be sure, but one that hints that this part is not to be taken as literal historical fact (but happens to be a more straight translation that the rest of it). Where I employ the ordinary preterite, a simple statement of action, that is what did occur. With that in mind, one can see that my taxicab research was also one hell of an adventure. Taxi Inferno is available from Amazon.